More 2016 Southern Rhone Super Stars! Completely destemmed and raised entirely in concrete, the 2016 Cotes du Rhone Domaine Nicolas Boiron is a serious Côtes du Rhône. The blend of 80% Grenache, 15% Syrah and 5% Cinsault is full-bodied and rich, with hints of tar and black olive layered over ripe black cherries. A bit of licorice emerges on the long, silky finish. Drink this beauty over the next 5-7 years. Rated 91/100 The Wine AdvocateLast of the 2016s, don’t miss the 2016 Côtes du Rhône, which had just been bottled at the time of my tastings. This medium to full-bodied beauty is packed with red and black fruits, dried flower and spice aromas and flavors, and has a silky, polished, undeniably delicious style ideal for drinking over the coming 3-4 years. A terrific example of this bottling, the 2016 Châteauneuf du Pape Cuvée Tradition is a blend of 75% Grenache, 12% Mourvèdre, 10% Syrah and tiny amounts of Cinsault, Counoise and Vaccarèse. About 40% was destemmed in this textbook vintage, the fruit coming from 40 different parcels around the appellation. Floral and raspberry notes emerge on the nose, while the palate is full-bodied but silky textured, ending on subtle shadings of Provence herbs and licorice. It's a relative bargain that's easy to drink now, but it should easily go a decade or more in a cool cellar. Rated 93/100 Wine AdvocateMoving to the reds, the deep ruby colored 2016 Châteauneuf-du-Pape (75% Grenache 12% Syrah 10% Mourvèdre aged in foudre and demi-muid) offers seriously good notes of red and black fruits, lavender and spice. It’s medium to full-bodied, has fine, polished tannin, solid mid-palate depth, and solid overall freshness. Drink it anytime over the coming 10-15 years. 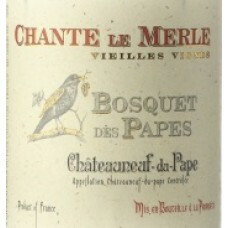 Rated 97/100 Wine AdvocateThe old vine cuvée from the estate is the 2016 Châteauneuf-du-Pape Chante Le Merle and it’s always a rough blend of 85% Grenache, 10% Mourvèdre and 5% Syrah that’s fermented with 100% whole clusters and aged mostly in foudre and old barrels. This classic Châteauneuf du Pape is bursting at the seams with notions of blackberries, peppery herbs, scorched earth, and licorice. With full-bodied richness, terrific depth of fruit and extract, fine tannin and first-rate purity, it’s going to benefit from short-term cellaring and cruise for 10-15 years. There are 10,000 bottles of the stunning 2016 Châteauneuf du Pape A la Gloire de Mon Grand-Père, which is good news for lovers of 100% Grenache. Drawn from a single parcel in the lieu-dit of Gardiole (mostly sandy soils), half of the fruit was destemmed. It's full-bodied and concentrated but silky and refined, with scintillating purity of cherry and raspberry fruit, backed by crisp acids and enlivening hints of orange zest on the long, reverberating finish. It's a terrific value that should drink well for more than a decade. Rated 96/100 The Wine AdvocateMade from 100% Grenache that was partially destemmed, the 2016 Châteauneuf-du-Pape A La Gloire de Mon Grand-Père is straight up awesome looking barrel sample. Sporting a deep ruby color and perfumed notes of strawberries, incense, Asian spices and dried garrigue, this beauty is full-bodied, layered, and opulent on the palate, yet with no weight and a graceful, balanced style. It has fine tannins which are still mostly covered by loads of fruit at this stage. It’s going to be hard to resist on release, yet should have two decades of longevity.